I support that. I often find myself having to calculate half (or otherwise) of a pixel count. Have you guys tried using percentages? It works and calculates right pixel value. The video's narrator also says you can use plus or minus, but doesn't demonstrate. Besides the notation pointed above by @KennethHuey *=50% (to scale to 50% for example) which implies replacing the existing field value, you can also use *50% immediately after the existing values to achieve the same result. For more information about the expressions you can use in the input fields please check Help ▸ Affinity Designer Help ▸ Workspace ▸ More ▸ Expressions for field input. You need % in the dropdown so that you can use % with macros. I agree with this also - can we please have a % unit so we can use it with macros. Simply having a % capability won't help much with macros. As we've learned, macros record the result (the final size) of the operation. You can't make a general macro, using resize, that will work for more than one output size. For a generalized macro, today, you need to use a different method than resize, such as an equations filter. Perhaps when Affinity improves macros they will make it possible to use resize for this. Any progress in adding % to resize units? Strange that such useful solution is not available despite that users were indicating such lack quite long ago. Did you notice in the replies above that resizing by % is already available, and has been? Unless you're wanting it for macro purposes (which still wouldn't work even with a pulldown such as was requested) it's just a cosmetic enhancement. The needed function is there and works. No, I did not and I see now. Apart of this they are not listed in "Units" so not obvious for many users. they﻿ are n﻿ot listed﻿ in "U﻿nit﻿s"
Percentage isn’t a unit of measurement. From technical point of view you are right. But from logical and workflow you are wrong. Percentage is listed between units in canvas/document size in most of professional apps. Units list is the best place to have them. This is logical for most if not all users, especially switching from other apps. Moreover having them there can solve macro problem. Moreover having them there can solve macro problem. No, it can't. Something more would be needed, as the current macro implementation saves the final computed size. Still will help as there will be way to easy, logically enter resize values. It's just as easy to enter 50% in the dimension field (I would actually argue it's easier) as it is to enter 50 and then access the pulldown to select the (non-logical) Percent as a unit. I think that you have no experience in programming. Present implementation is unusable in the context of macros. 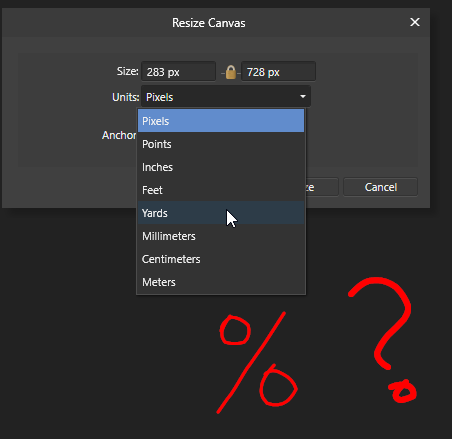 Macro engine will not be able to find when user wants macro engine to use % and when physical value (number of pixels for example). The only logical way of solving this problem is to inform application what user wants. And in such case adding percent to unit list is the easiest way and fastest to use and implement. Moreover such way is logical for users switching from other apps. And if we want Affinity not to misuse terms then, for example, crop tool should be renamed to resize as it allows extend canvas size, not only crop it, right? Instead of being language purists we should focus on efficiency of app use. Actually, I've been a programmer since about 1966 (52 years or so), across many languages and systems, on both small (personal) and very large (team/commercial) projects. To use percentages for resizing, now, the user goes to the dimension box of choice and enters, for example, 50% (or, perhaps it's *50%). If the user's input were captured by the macro then that is a clear indication of what the user wants to do. 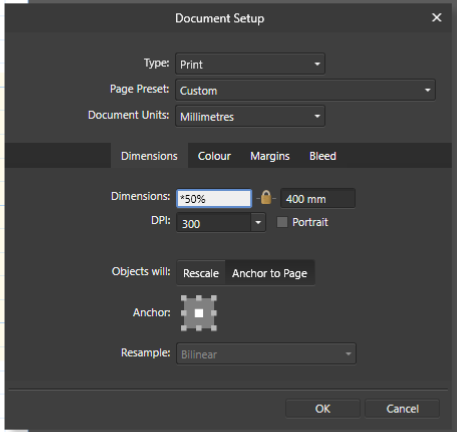 Unfortunately, today the macro does not capture the user's input but instead it captures the result of the calculation, and that's the root issue with macros doing resizing in Affinity today. Yes, it's odd that a crop tool can increase the size. But that's different, and doesn't justify calling % a unit in the dialog we're talking about. No, it is not. If initial value was, for example, 127 then macro will not know if user entering 300%, want macro to act as 300% or just as value 381. Of course we can limit usability the way that entering % will always act as % and force user to use additional calculator but why? Moreover such behaviour will make dialog to work inconsistently. In macro recording as forced % and not in macro recording as pocket calculator. Inconsistency is one of biggest UI programing errors. No, it is just example that argumentation about supremacy of Affinity over other app in the matter of misusing terms. Affinity apps are not mathematical nor physics apps so putting % in the list of units will not destroy the world.